Rechargeable batteries based on magnesium, rather than lithium, have the potential to extend electric vehicle range by packing more energy into smaller batteries. But unforeseen chemical roadblocks have slowed scientific progress. And the places where solid meets liquid – where the oppositely charged battery electrodes interact with the surrounding chemical mixture known as the electrolyte – are the known problem spots. Now, a research team at the U.S. Department of Energy’s Joint Center for Energy Storage Research, led by scientists at Lawrence Berkeley National Laboratory (Berkeley Lab), has discovered a surprising set of chemical reactions involving magnesium that degrade battery performance even before the battery can be charged up. The findings could be relevant to other battery materials, and could steer the design of next-generation batteries toward workarounds that avoid these newly identified pitfalls. The team used X-ray experiments, theoretical modeling, and supercomputer simulations to develop a full understanding of the chemical breakdown of a liquid electrolyte occurring within tens of nanometers of an electrode surface that degrades battery performance. Their findings are published online in the journal Chemistry of Materials (“Instability at the Electrode/Electrolyte Interface Induced by Hard Cation Chelation and Nucleophilic Attack”). The battery they were testing featured magnesium metal as its negative electrode (the anode) in contact with an electrolyte composed of a liquid (a type of solvent known as diglyme) and a dissolved salt, Mg(TFSI)2. While the combination of materials they used were believed to be compatible and nonreactive in the battery’s resting state, experiments at Berkeley Lab’s Advanced Light Source (ALS), an X-ray source called a synchrotron, uncovered that this is not the case and led the study in new directions. “People had thought the problems with these materials occurred during the battery’s charging, but instead the experiments indicated that there was already some activity,” said David Prendergast, who directs the Theory of Nanostructured Materials Facility at the Molecular Foundry and served as one of the study’s leaders. Molecular Foundry researchers developed detailed simulations of the point where the electrode and electrolyte meet, known as the interface, indicating that no spontaneous chemical reactions should occur under ideal conditions, either. The simulations, though, did not account for all of the chemical details. Commercially popular lithium-ion batteries, which power many portable electronic devices (such as mobile phones, laptops, and power tools) and a growing fleet of electric vehicles, shuttle lithium ions – lithium atoms that become charged by shedding an electron – back and forth between the two battery electrodes. These electrode materials are porous at the atomic scale and are alternatively loaded up or emptied of lithium ions as the battery is charged or discharged. In this type of battery, the negative electrode is typically composed of carbon, which has a more limited capacity for storing these lithium ions than other materials would. So increasing the density of stored lithium by using another material would make for lighter, smaller, more powerful batteries. Using lithium metal in the electrode, for example, can pack in more lithium ions in the same space, though it is a highly reactive substance that burns when exposed to air, and requires further research on how to best package and protect it for long-term stability. Magnesium metal has a higher energy density than lithium metal, meaning you can potentially store more energy in a battery of the same size if you use magnesium rather than lithium. Magnesium is also more stable than lithium. Its surface forms a self-protecting “oxidized” layer as it reacts with moisture and oxygen in the air. But within a battery, this oxidized layer is believed to reduce efficiency and shorten battery life, so researchers are looking for ways to avoid its formation. To explore the formation of this layer in more detail, the team employed a unique X-ray technique developed recently at the ALS, called APXPS (ambient pressure X-ray photoelectron spectroscopy). This new technique is sensitive to the chemistry occurring at the interface of a solid and liquid, which makes it an ideal tool to explore battery chemistry at the surface of the electrode, where it meets the liquid electrolyte. Even before a current was fed into the test battery, the X-ray results showed signs of chemical decomposition of the electrolyte, specifically at the interface of the magnesium electrode. The findings forced researchers to rethink their molecular-scale picture of these materials and how they interact. What they determined is that the self-stabilizing, thin oxide surface layer that forms on the magnesium has defects and impurities that drive unwanted reactions. A further round of simulations, which proposed possible defects in the oxidized magnesium surface, showed that defects in the oxidized surface layer of the anode can expose magnesium ions that then act as traps for the electrolyte’s molecules. 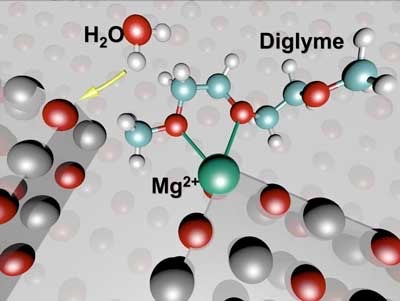 If free-floating hydroxide ions – molecules containing a single oxygen atom bound to a hydrogen atom that can be formed as trace amounts of water react with the magnesium metal – meet these surface-bound molecules, they will react. This wastes electrolyte, drying out the battery over time. And the products of these reactions foul the anode’s surface, impairing the battery’s function. It took several iterations back and forth, between the experimental and theoretical members of the team, to develop a model consistent with the X-ray measurements. The efforts were supported by millions of hours’ worth of computing power at the Lab’s National Energy Research Scientific Computing Center. Researchers noted the importance of having access to X-ray techniques, nanoscale expertise, and computing resources at the same Lab. Crumlin added, “We’ve already started running new simulations that could show us how to modify the electrolyte to reduce the instability of these reactions.” Likewise, he said, it may be possible to tailor the surface of the magnesium to reduce or eliminate some of the unwanted chemical reactivity.